On February 9, at 01:49 an emergency call was received to “911” service that a car accident had occurred on the roadway of Aruch village, Aragatsotn Province. The rescuers' help was needed. 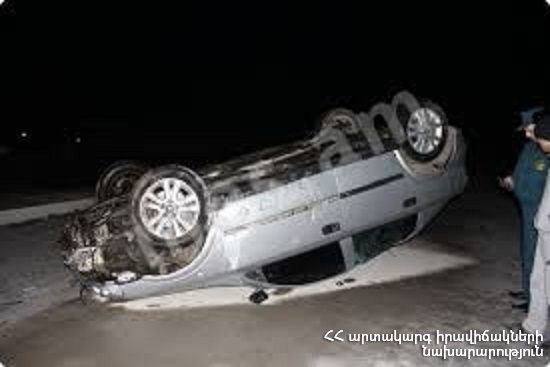 It turned out that “Nissan X-Trail” car had run off the roadway and turned over on the 50th km of Yerevan-Gyumri highway. One of the passengers died on the spot. Three passengers were taken to the medical center of Talin town by local forces, the driver was hospitalized to “Armenia” Republican Medical Center. According to doctors the driver and one of the passengers were in serious and the other passengers - in fair condition. The rescuers removed the corpse of the passenger to ambulance car, disconnected the automotive battery and closed the gas valve of the car.